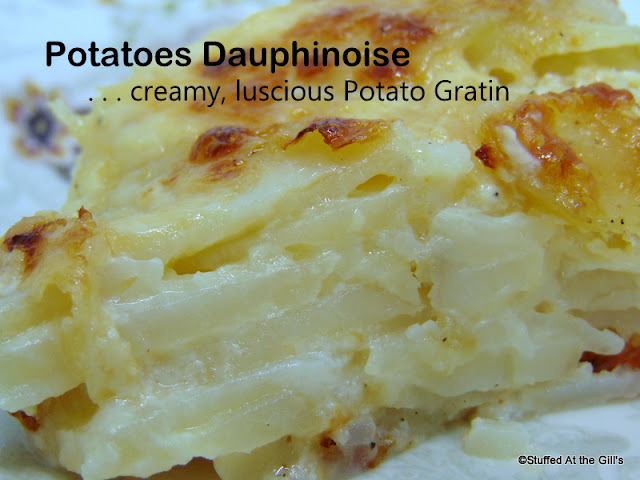 Potatoes Dauphinoise are a French inspired, creamy, luscious potato scallop layered with cream and milk and baked to golden brown perfection. I love potatoes. 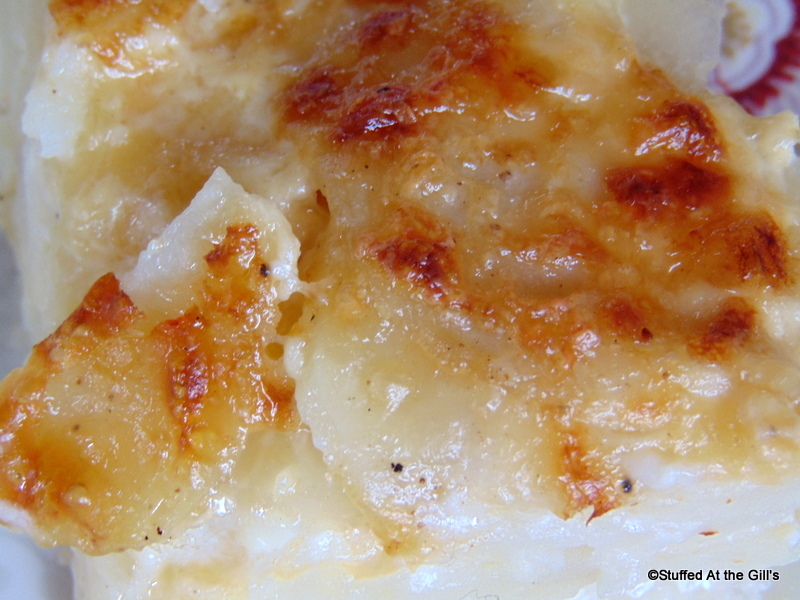 Mashed, baked, fried, and scalloped potatoes go down good at just about any meal. I even like them with pasta. But these potatoes are special and very rich, made with heavy cream and the option to add cheese. Now, a word of warning, a caution, a disclaimer: DO NOT EAT THESE EVERY DAY OR EVEN EVERY WEEK! I WILL NOT BE RESPONSIBLE IF YOU GAIN WEIGHT. Okay, now that that's out of the way I'll explain. 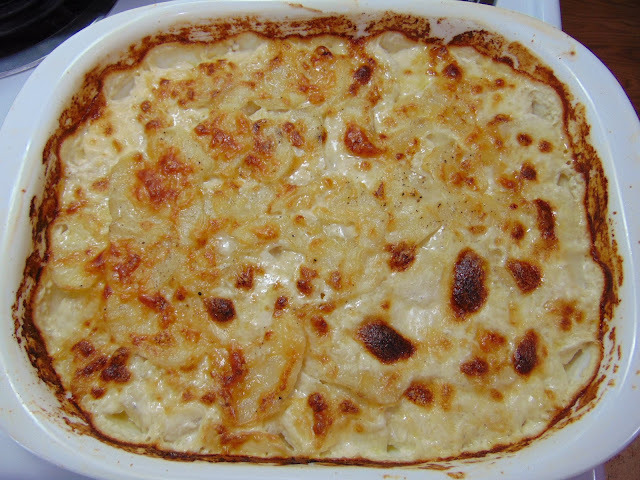 These potatoes are so rich in cream they could just make you break out in fat if you ate them too often. 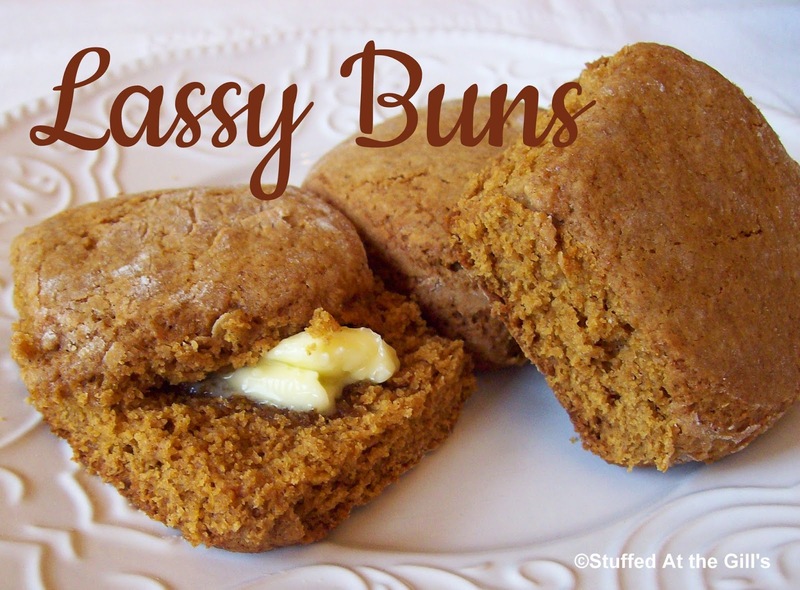 They are so delicious you'll want to eat them all the time but please constrain yourself for your health's sake. Keep them for special meals with family and friends so there won't be any left overs for you to eat. Although these potatoes have a fancy name they are really just a potato scallop but one with a French influence. 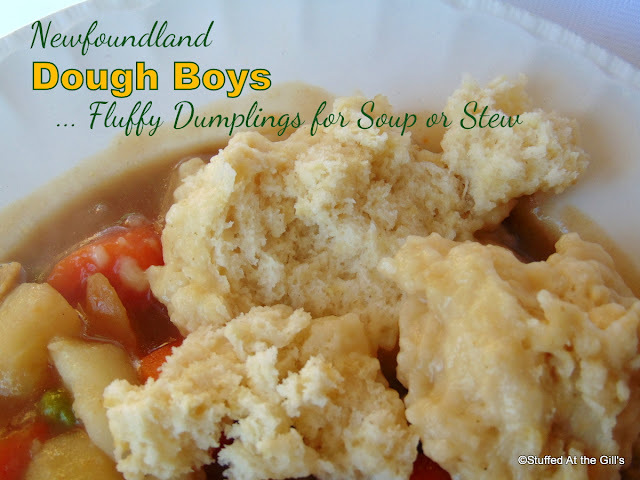 I've found dozens of recipes and all of them with slight differences. Some have cheese. Some are plain. Some are made with just milk. Some are made with just cream. And some are made with a mix of milk and cream. I even found a recipe which included eggs. The one thing they all have in common beside the potatoes is the seasoning: garlic, nutmeg, salt and pepper. When making these potatoes season well with salt. Use pepper to your own taste. The nutmeg should be used sparingly. The taste of nutmeg should barely be recognizable and when eating one should wonder what that taste is. 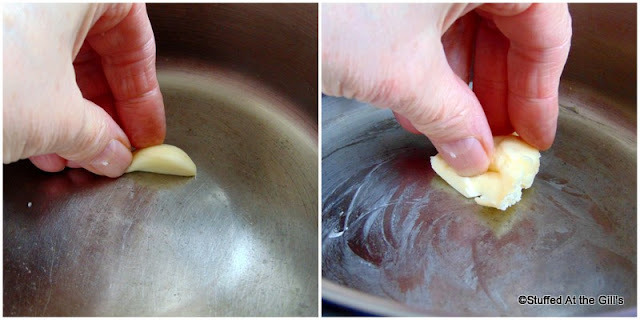 Although in most recipes the garlic is only rubbed over the surface of the dish, a little may be finely chopped and added to some of the layers. Usually, if using cheese, it is a type of Swiss cheese but if you want to use Cheddar or some other kind go ahead. Swiss cheese can be very expensive. Cut the potatoes into ⅛- to ¼-inch slices. If you have one, use a food processor with the slicing blade to cut the potatoes. A good sharp knife works very well, too. If you are using new potatoes, you may leave the skin on. If you are not going to be making the dish immediately, place sliced potatoes in cold water. Drain and pat dry before using. You will need a 12-inch round or a 9x12-inch baking dish. Rub the inside of the baking dish with the cut garlic and grease with the butter. If you wish, finely chop the remaining garlic and sprinkle between the layers. Preheat oven to 325 degrees. Place the milk and cream in a small saucepan and heat below boiling over low heat while preparing the potatoes. Place a layer of sliced potatoes in the bottom of the dish. Sprinkle with a little of the nutmeg and salt and pepper. 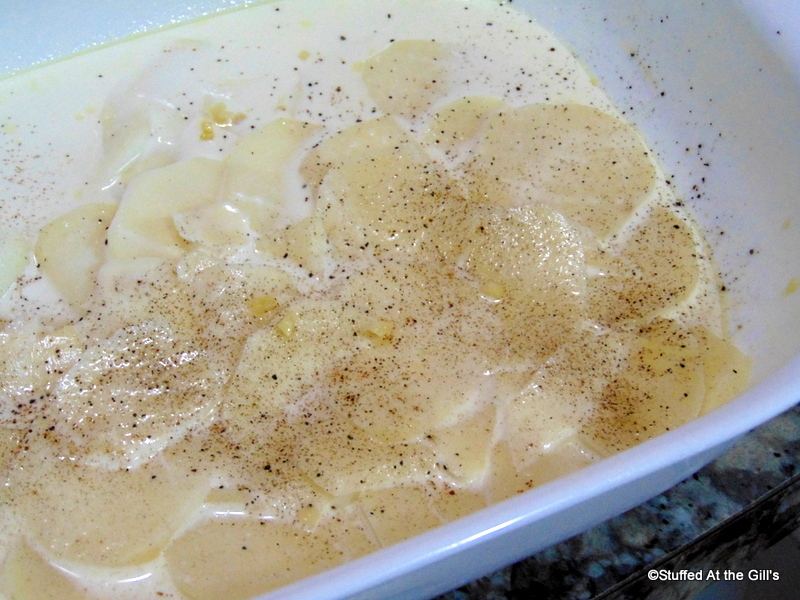 Spoon some of the hot milk/cream mixture over the potatoes. 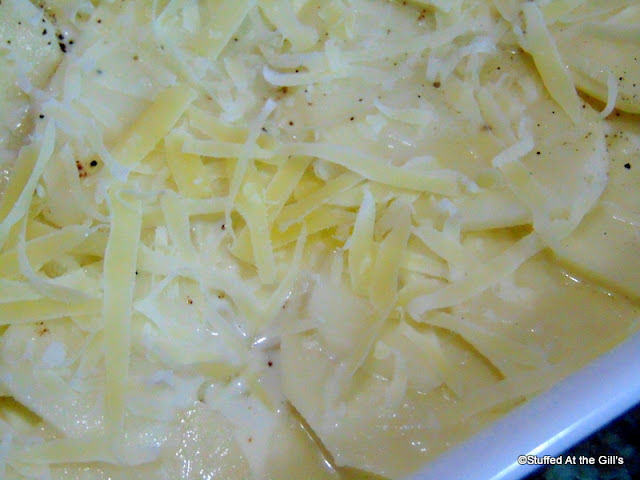 If using, sprinkle a little of the cheese over the potatoes. Repeat layers until potatoes are used up. 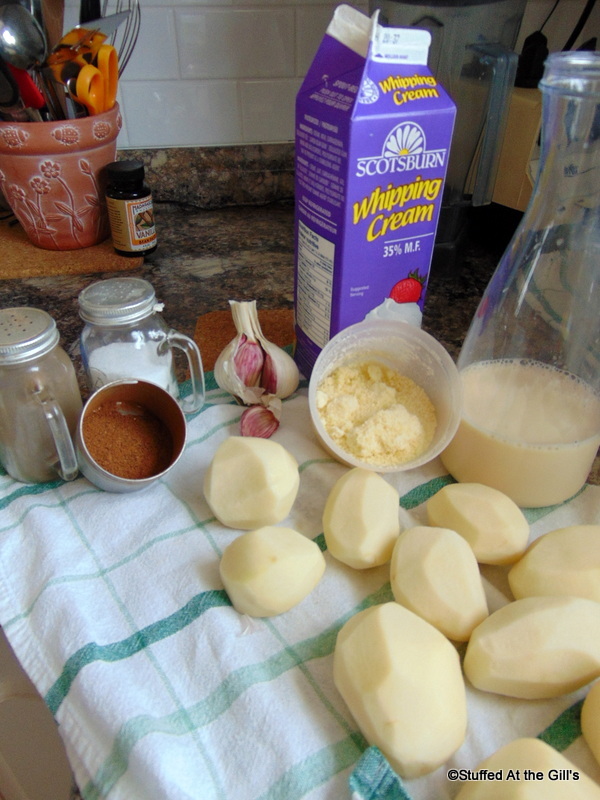 Pour any leftover milk/cream over the top of the potatoes. 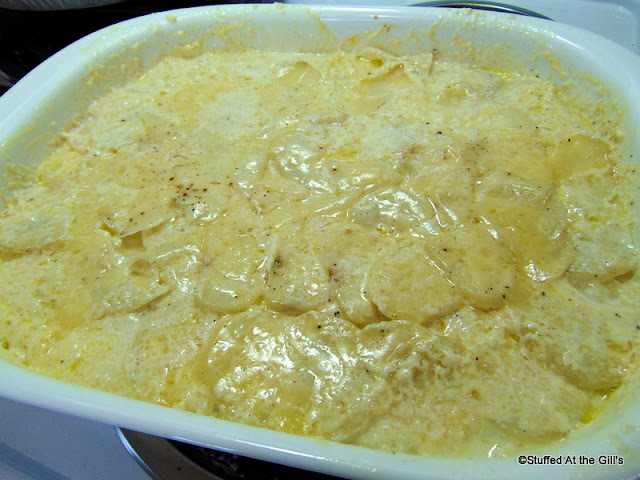 The potatoes should be almost covered with the milk. 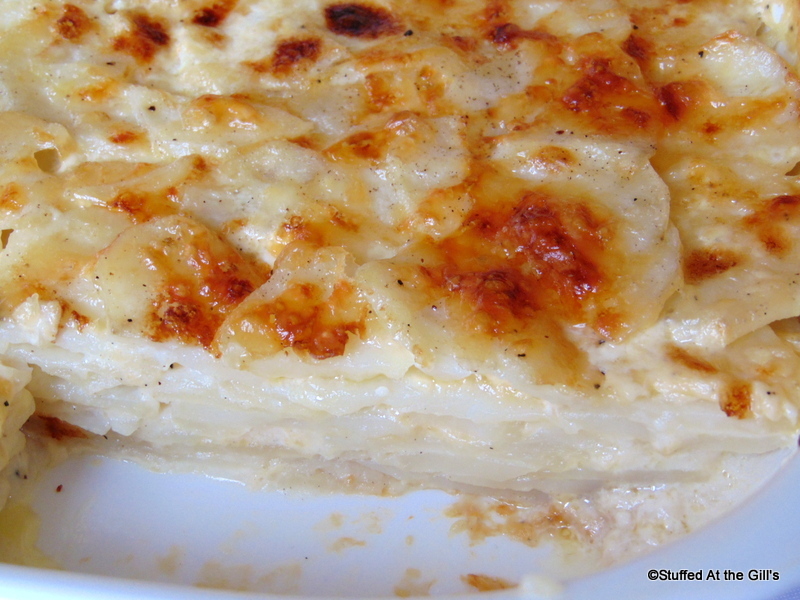 If you find the potatoes are not covered with milk, add a little more. Sprinkle with cheese, if using. Cover with foil. Bake in the preheated for 45-50 minutes. 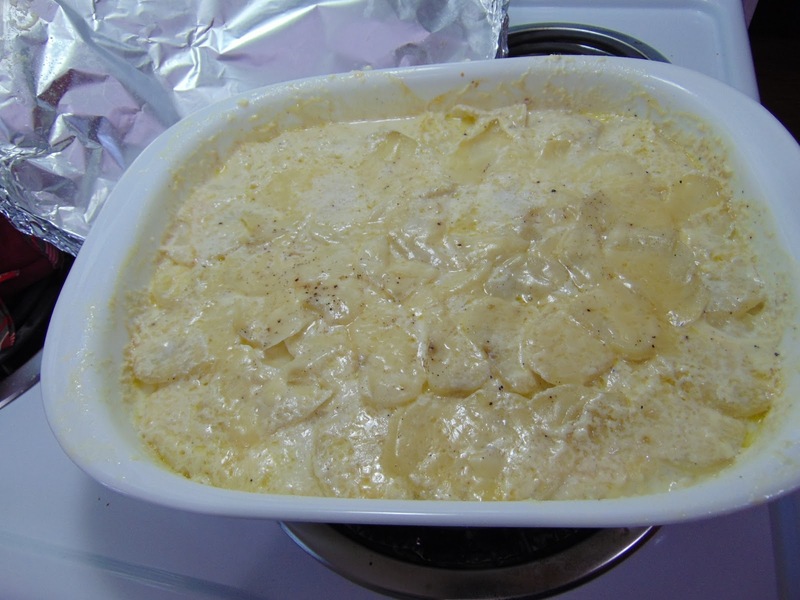 Remove the foil and bake an additional 40-45 minutes until potatoes are soft and the top is a rich golden brown. Let potatoes set for 10-15 minutes before serving. 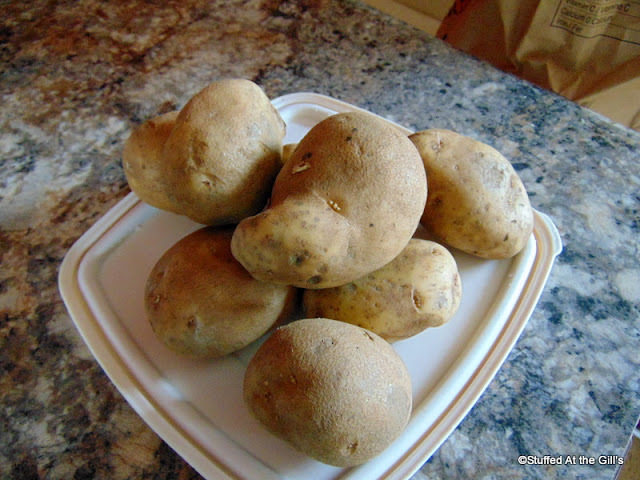 The amount of potatoes in 3 pounds will vary according to the size of your potatoes. You will want enough sliced potatoes to fill your dish about ¾ full. 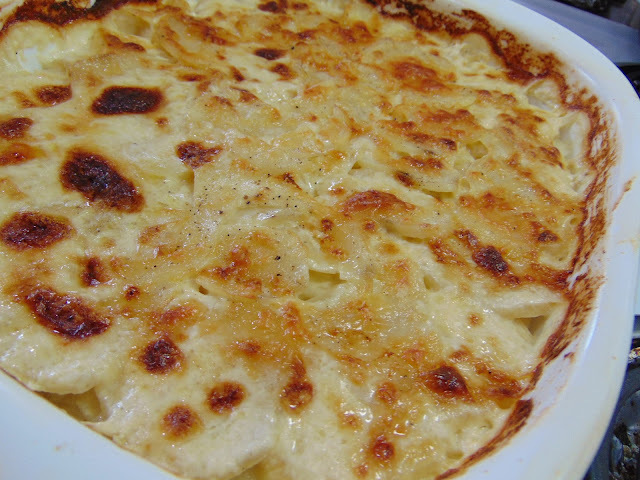 The ingredients for the Potatoes Dauphinoise: Potatoes (of course), milk, cream, cheese which is optional, garlic, nutmeg, salt and pepper. Forgot the butter for greasing the dish. 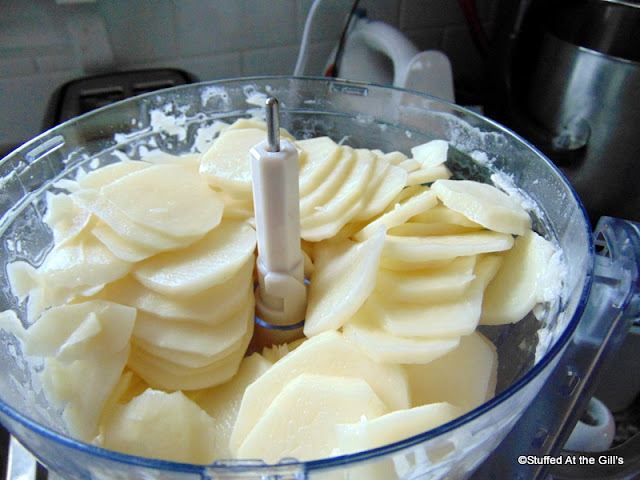 A food processor makes quick work of slicing the potatoes. Rub the cut side of the garlic clove all over the bottom and sides of your baking dish. Then grease the dish with butter. 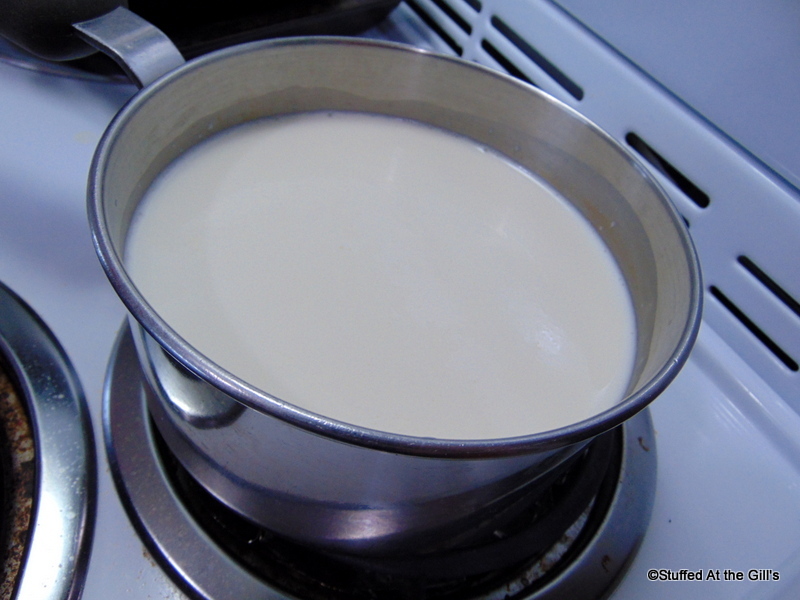 Heat the milk and cream together over low heat. Keep the temperature below boiling. Don't want to curdle that cream with too high a temperature. Once the milk/cream, the potatoes and the baking dish are ready you may begin to assemble the casserole. 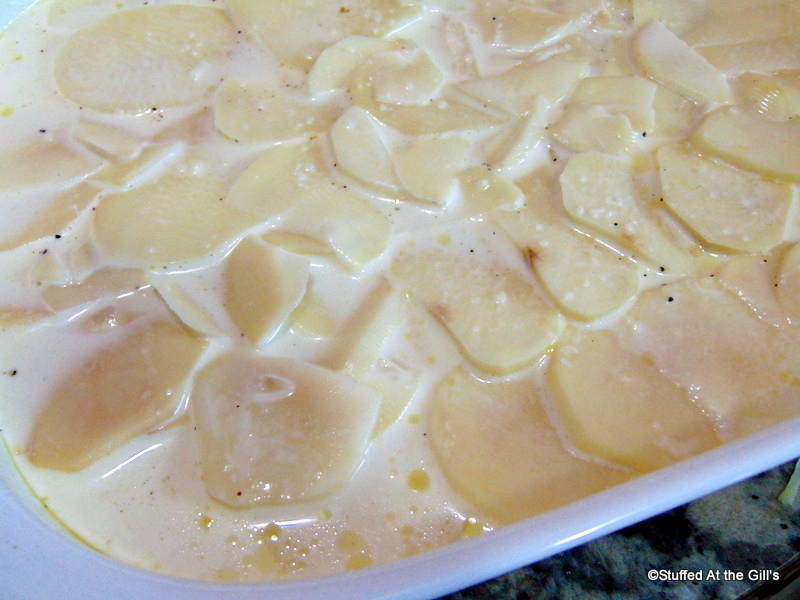 Place a layer of potatoes on the bottom of the prepared dish. Sprinkle with salt, pepper, the smallest amount of nutmeg and the milk/cream mixture. 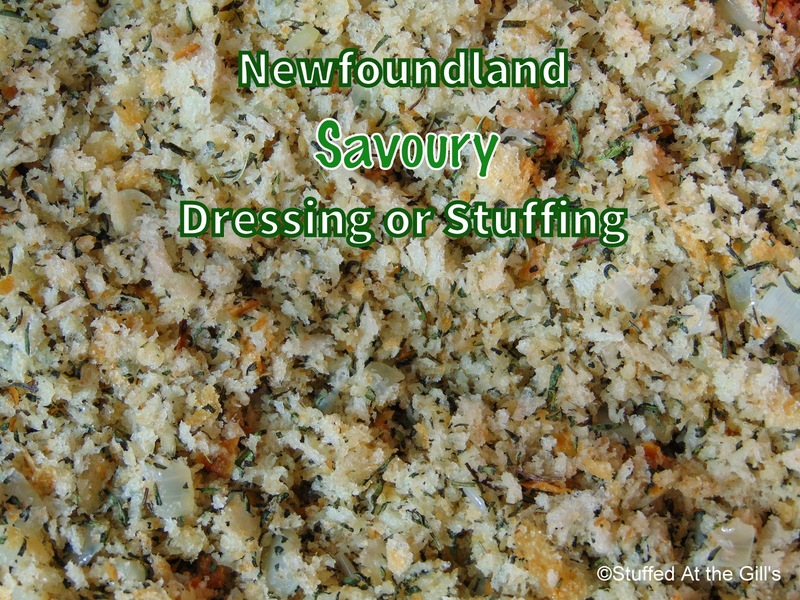 If you are using cheese sprinkle on a few layers. You do not need cheese on every layer. Keep some cheese for the top. Keep building up the layers. Make sure you season well with salt and keep the nutmeg light. You really don't want to taste the nutmeg. You just want a hint. 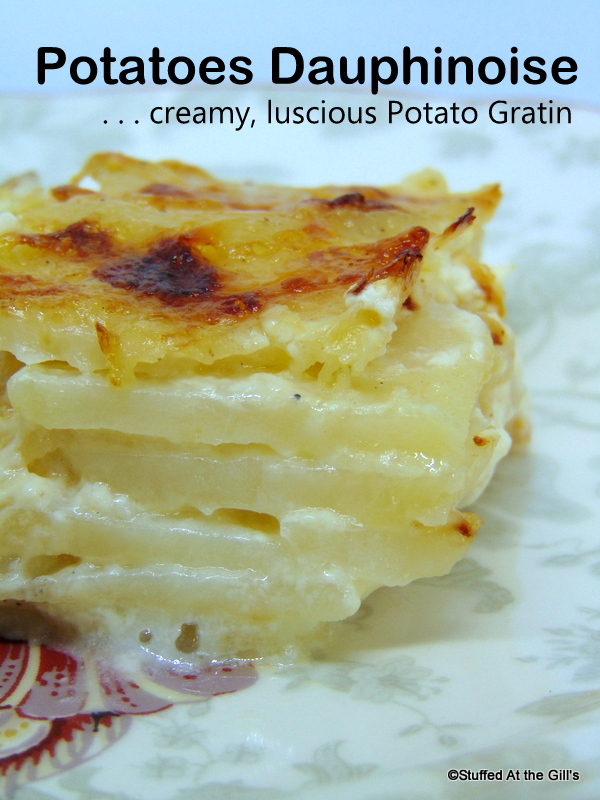 When all the potatoes are layered pour any leftover milk/cream mixture over the top. You want the liquid to just about cover the potatoes. Add more milk or cream if you don't have enough. Sprinkle the top with more cheese, if using. 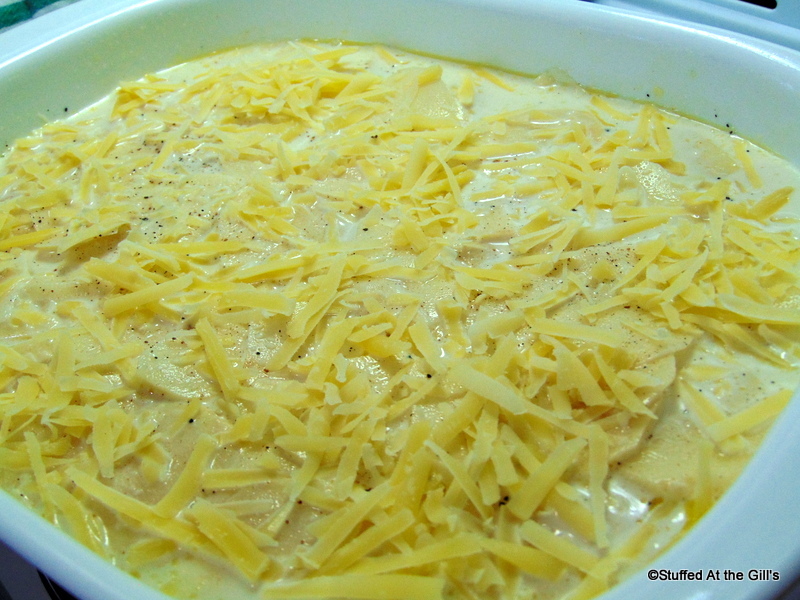 Cover the baking dish with foil and bake 45-50 minutes. 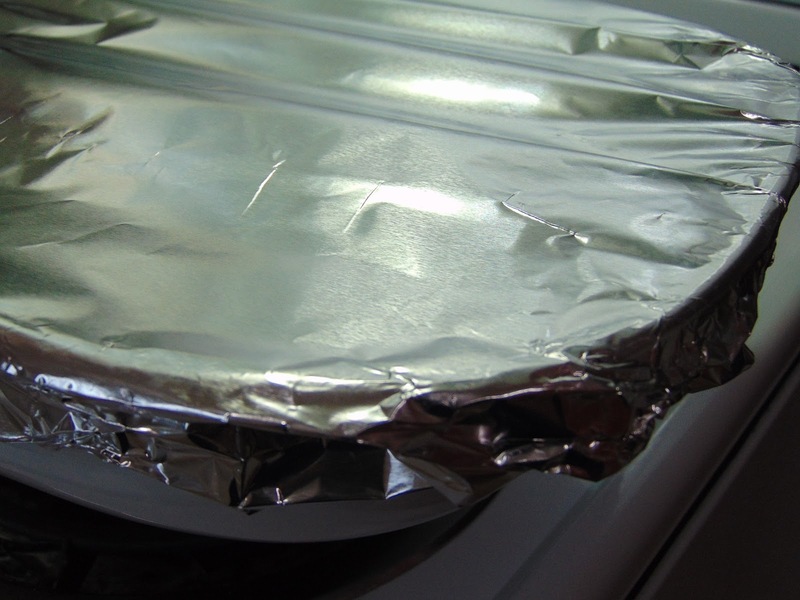 After 45-50 minutes, remove the foil and return to oven to bake an additional 40-45 minutes. Bake until your potatoes have a lovely golden brown top. If your potatoes have not browned enough but they are cooked, place under the broiler for 3 or 4 minutes watching carefully they do not burn. Before serving let the Potatoes Dauphinoise set for about 10-15 minutes. 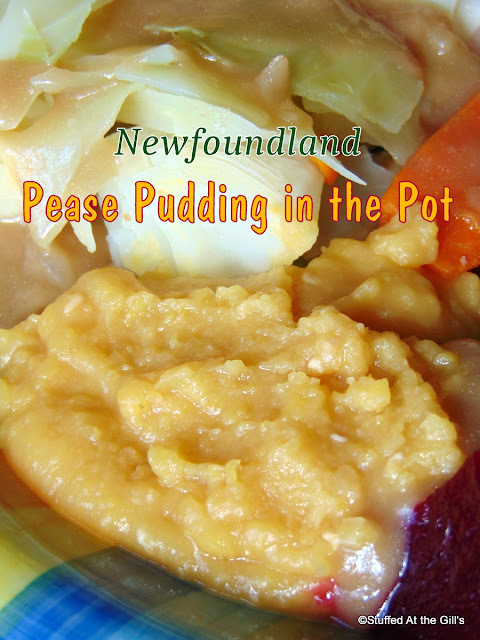 Serve as a delectable side-dish for any special meal. 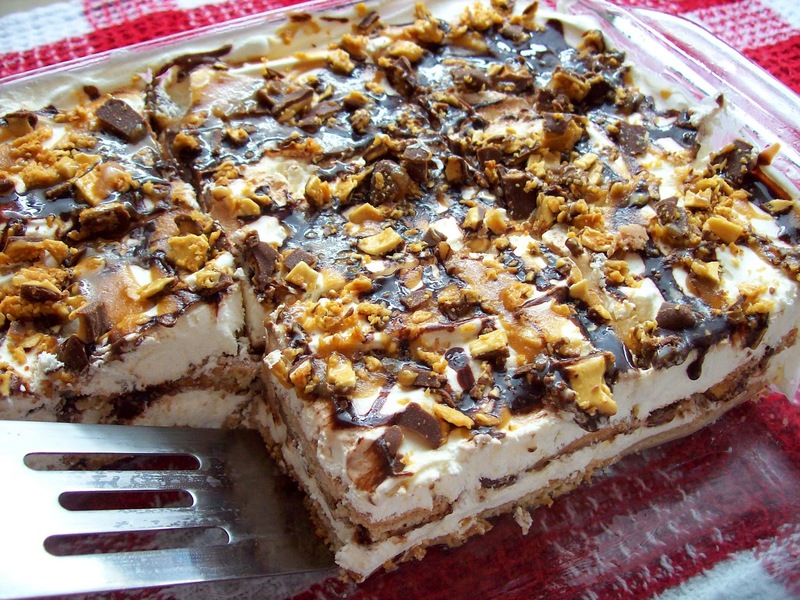 Luscious, creamy and oh, so good! Glad you liked it. It's a favourite of mine.